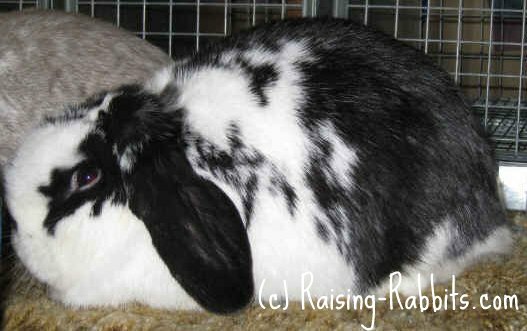 French Lop Rabbit - history, description, standards, and photos of the French Lop breed. 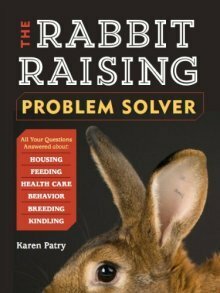 Is this massive lopped rabbit breed right for you? 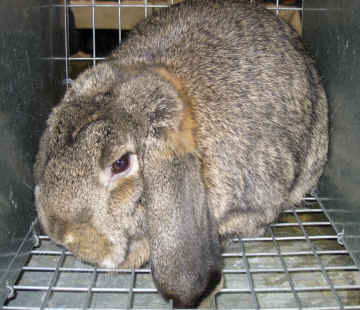 In 1863, Mr. Cordonnier, of Breteuil, France, began his efforts to develop the French Lop. 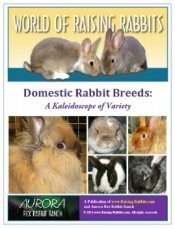 He started with the storied English Lop, and then used large French breeds, the Normand (also known as the Picard), the chunky-headed Rouennais (now extinct), and the French breed known as the Butterfly. The Butterfly was a modified Flemish Giant – shorter, with an approximate weight of 15 pounds, which is still shown in France. When he was done, he had a rabbit that still quite resembled the English Lop, however had shorter ears and was blockier in the body. He called it the French Lop. French Lops were not show animals – they were very large meat rabbits. By 1869, French Lops had found their way into Germany and by 1899, into Switzerland. This broken black French Lop received the coveted Best of Breed award. Just when the French Lop showed up in the USA is unknown, but it was clearly early in the 20th century. It was one of the first breeds recognized by the National Pet Stock Association (ARBA forerunner) when it was organized in 1910. Interestingly in the US, the French Lop of the day had standards identical to those of the English Lop, except that shorter ears were required. The breed did not enjoy much popularity in those first decades. As a meat rabbit, it may have been outshined by both the New Zealand Rabbit and the American Rabbit. Around 1970, interest in the French Lop was reborn. The Lop Rabbit Club of America was formed in 1971, and breeders imported fresh French Lop blood from Belgium, Germany, Holland, and Switzerland. The formation of the national club provided a boost of publicity and marketing to both English and French Lops. Selective breeding has created significant differences between the French and the English Lops. Both of them are very large, with no maximum weights. But while the English Lop retained its prodigious ears, semi-arched shape and long body, the French Lop now offers a solid and blocky body. The word “massive” should come to mind. Its ears should be substantial, but in proportion with the rest of the rabbit. The French Lops in the USA come in various colors, and are very large and blocky. They must weigh a minimum of 10.5 pounds (6 kg) with no upward weight limit. Their ears are of a more balanced length than those of the English Lop.